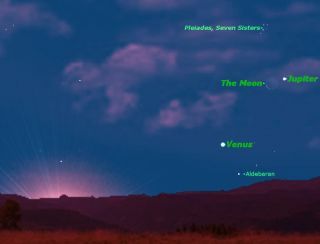 Moving right along from its transit across the sun on June 5, 2012, Venus is now a morning "star," joining the moon and Jupiter in a dawn conjunction on Sunday, June 17. It's only been a week since Venus crossed the face of the sun, but now the brilliant planet has moved into the morning sky. The transit of Venus in front of the sun on June 5 is an example of what astronomers call a "conjunction," which occurs when two or more astronomical bodies are close together in the sky. Technically the transit was a special case called an "inferior conjunction" of Venus with the sun because Venus passed in front of the sun. When Venus passes behind the sun, it is called a "superior conjunction." These terms are used only for Venus and Mercury because these are the only planets closer to the sun than the Earth, and so can pass either in front of or behind the sun from our perspective. This week Venus is a participant in another conjunction, this time a triple conjunction with the planet Jupiter and Earth's moon on Sunday morning (June 17). This conjunction gathers together the three brightest objects in the night sky. Both the moon and Venus are extremely thin crescents, both being almost completely backlit by the sun. If you have a telescope, look for an extension of the cusps of Venus. The apparent closeness of Venus and Jupiter in the sky is an illusion, since not only is Jupiter much farther from the sun than Venus, but it is also currently on the far side of the sun, about as far away from us as it can get. Although both look quite bright to the naked eye, a telescope will show that Jupiter has a much lower surface brightness because of its far greater distance from the sun. Venus is nowhere near as bright as it can get because only a narrow sliver of a crescent is reflecting its light to us. It will grow in brightness over the next few weeks reaching maximum brilliance on July 12. Because of their geometry relative to the sun, the moon's crescent is waning (shrinking) while Venus' crescent is waxing (growing). In two days, the moon will pass between us and the sun and move into the evening sky, but Venus will remain in the morning sky until it reaches superior conjunction with the sun on March 28, 2013, when it will return to the evening sky. Editor's note: If you snap a great photo of Venus, Jupiter and the moon together in the night sky and would like to share it for a possible story or gallery, send images and comments to SPACE.com managing editor Tariq Malik at tmalik@space.com.